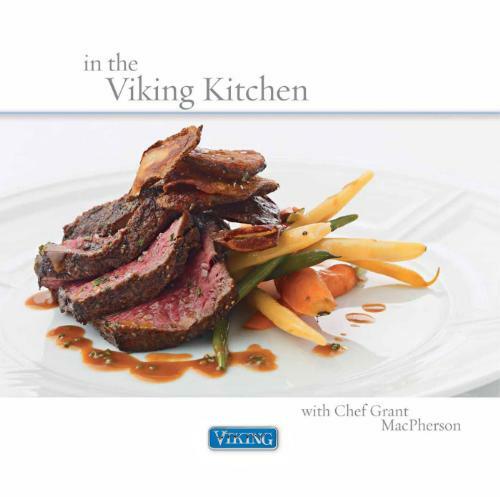 GREENWOOD, Miss., March 10, 2011 /PRNewswire/ — Viking Range Corporation, in collaboration with internationally renowned Chef Grant MacPherson, has introduced its first cookbook, In the Viking Kitchen. In a collection lavishly photographed by Bill Milne, the book presents an array of over 100 accessible recipes that showcase the beauty and visually stimulating side of home cooking. Click on through to read the rest of the press release. Having lived and cooked on four continents during his culinary career, MacPherson has assembled a bold melange of world cuisines. Yet cooks of all skill levels will find recipes that can be easily mastered. Beginners will find plenty of tasty options, from Homemade Lemonade to Fork-Crushed Sweet Potatoes to Cajun Turkey Breast with Creamed Minted Peas. For more ambitious culinarians, there is no shortage of recipes requiring a deeper knowledge of ingredients and technique, such as Singapore Chili Crab and Pig’s Ear Salad with Red Shallot Vinaigrette. The luscious photographs that accompany each recipe transform this collection into a book that is equally at home in the kitchen or on the coffee table. Milne also provides relevant commentary throughout the book about the importance of equipment form and function, particularly with regards to enhancing the cooking and dining experience. Photographs of stunning Viking kitchens, both commercial and residential, are scattered among the pages, providing design inspiration as well. Viking Range Corporation is an ultra-premium major appliance manufacturer and culinary lifestyle company that originated commercial-type appliances for the home and is the creator of the “Professional” category of major appliances. Viking is headquartered in Greenwood, Mississippi. Viking major appliances are sold through a network of premium appliance distributors and dealers worldwide, and Viking culinary products are sold through a network of premium gourmet retailers. To request product information, please contact Viking toll-free at 888.845.4641, or visit the web site at vikingrange.com. VIKING is a registered trademark of Viking Range Corporation. Chef Grant MacPherson was a gold medalist at the 1992 Culinary Olympics in Frankfurt, Germany and has directed prestigious resort kitchens on five continents, including The Regent, The Ritz-Carlton, The Four Seasons, Malaysia’s Datai Hotel, and the Raffles Hotel in Singapore. MacPherson’s vast experience also includes leading the culinary operations for the esteemed Steve Wynn organization for 10 years. Opening and overseeing operations of 50 food and beverage venues, he set the bar in high caliber dining and garnered numerous accolades for The Bellagio, Wynn Las Vegas and Wynn Macau. Under MacPherson’s direction, each Wynn resort received Five Diamond AAA Awards, Forbes Five Star Awards and Michelin Guides Five Red Pavilions Awards. In June 2010, Chef MacPherson opened Rustica, an exclusive modern Italian restaurant, at Fashion Island in Newport Beach, California. Chef MacPherson was named the Executive Chef for Viking Range Corporation’s Commercial Division in early 2010. Chef MacPherson graduated with honors from Niagra College in Niagra Falls, Canada. In 2006, his alma mater awarded him an Honorary Bachelor of Applied Studies Degree for outstanding professional and personal achievements in the fields of culinary arts and hospitality.